A sweet knitting companion, this stoneware bowl keeps skeins of yarn organized between each knit and purl. Your knitting circle just got a little sweeter. With a hand-sculpted sparrow perched along its edge, Aaron A. Harrison,'s stoneware bowl keeps skeins of yarn in place while you knit, crochet, or weave. 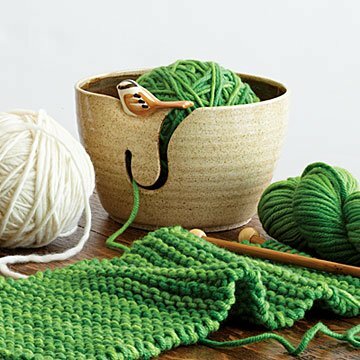 A hooked opening allows the yarn to unfurl in a steady stream, and holes pierced in the bowl's side offer a convenient resting spot for needles between knits and purls. A little bird told us that this is the perfect crafting companion for when you're creating your own homespun creations for all your close-knits. Handmade in upstate New York. “There is an acute connection between clay and other crafts that I strive to enhance,” says sculptor Aaron A. Harrison. “Whether it be sewing, knitting, crocheting, or cooking, I hope my pieces can tease and extract that inner desire to create that resides in each one of us.” The son of an architect father and artist mother, Aaron quickly gravitated toward all things creative. LEGO towers gave way to kindergarten art contest wins, which eventually drove him to pursue an MFA in ceramics and sculpture. Today, Aaron works out of his 500 square foot studio in upstate New York where he sculpts, paints, and packs each individual piece himself. Visit our blog to read more about Aaron and his creative process. Yarn and knitting needles not included. My mom keeps this with her knitting items and loves it. I use it on a daily basis to use yarn which doesn't tangle & which doesn't roll away. I knit every day & this is a handy, useful & attractive item. A truly clever knitting tool. This was a gift and I understand from the recipient that will be a useful tool for knitting. Keeps your yarn ball rolling without getting tangled up while knitting. I would buy this product as a gift again. I gave this as a gift. The recipient was so thrilled because it was handmade, inspirational and functional. Useful to keep yarn from rolling away and getting tangled. Bowl is both functional and is pretty enough to display. I would purchase this again. Liked that the artist had his history and personal card included. I love the bowl. Much smaller than I thought it would be. I will give this bowl for a Christmas gift. I am sure she will use it and love it!